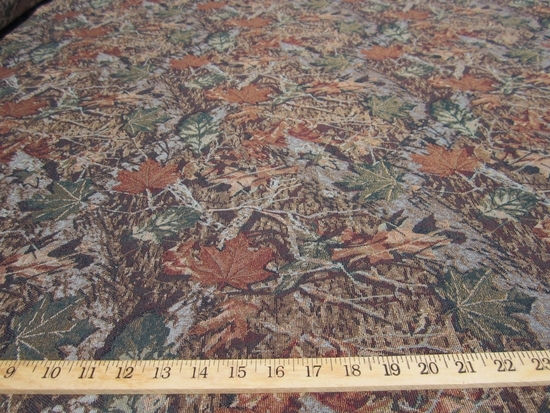 From Regal Fabrics camouflague leaf color "dusk"tapestry. This fabric has leaves and twigs all over in a camo pattern. It's a regular upholstery tapestry made for sofas and chairs. Colors are tans, browns, green, rust, spice. It's railroaded (pattern goes across the roll) with repeat of 13"h x 13"v. Contents are cotton and polyester blend. Width of fabric is 55".